You only have to look at these chickens to understand why they got their name. These chickens are very unique they don’t look like any other breed. Their feathers are not barbed like other breeds each individual feather is attached and sit around the chicken like a fluffy feather duster. This may cause them to get cold in the winter. 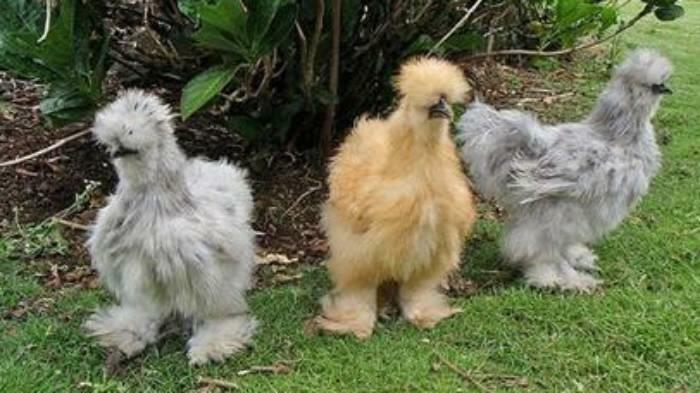 The silkies are one of the most popular chicken breeds. They are mid-sized and weight around 1.5kg- 2kgs. They are a very easy pet to maintain only need to be feed once a day and have a constant supply of fresh clean water. The Silkie can lay quiet easily 6-8 eggs at a time; the eggs are smaller than other breeds but full of flavor. Unlike other chicken breeds these like Silkie cannot fly due their feather structure so their nesting boxes and perches have to be low and easy to reach. This also makes them more of a target for dogs, cats and foxes so a safe chicken coop is in need for these little critters. There is more than one reason for why the Silkie is a perfect addition for a little hobby farm or even for a pet. One of the biggest reasons is their docile and submissive nature; mine were very affectionate and would sit on my knee all day long if I had the time. They are the perfect around children due to their nature and it gives the children a great opportunity to learn about poultry without the fear of being bitten or scratched. Another reason is that they are reasonably quite and would lay eggs without a rooster as the breed is known as the best mothers of the chicken world. They are one of the most broody (which is the urge to sit on the eggs) breeds. Overall I would recommend the Silkie breed to anyone they are a great addition to any home.